An essential part of the exploration of the galaxy is the ability to travel from one star system to another. To accomplish this most governments have developed Warp Drive or a similar form of propulsion to accomplish these goals. As exploration has progressed new, exciting technologies have emerged that have enhanced faster than light travel. Coaxial Drive is an advanced propulsion system that could propel a vessel over large distances nearly instantaneously. The Coaxial Drive functions by drawing in subatomic particles and reconfiguring their internal geometries utilizing a neutrino envelope and an antineutrino catalyst regulated by a polaric modulator, thereby folding the fabric of space time and generating an artificial wormhole between two points. The Drive is incredibly dangerous and, so far, has only been employed on a limited number of Starfleet vessels. 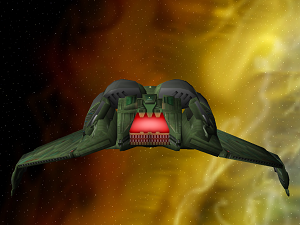 Quantum Slipstream Drive is an advanced form of propulsion acquired by the Federation from Species 116. Similar to Transwarp Drive, a Quantum Slipstream Drive operates by transferring specialized power through a vessel's shields; which generates a focused quantum field in subspace to travel between two points at speeds faster than Maximum Warp. Slipstream requires constant computations to maintain stability and, as such, any disruption to the user's computer systems could cause catastrophic systems failure that would result in vessel destruction. Transwarp Drive is an enhanced form of Warp Drive that overcomes several limitations of the original with the assistance of the vessel's shields. 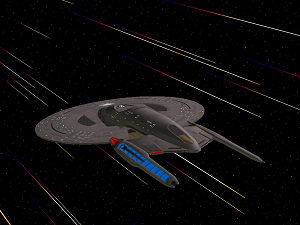 After engaging the Warp Drive, the vessel using a Transwarp Drive will emit tachyon bursts from the Deflector Dish into space. The subspace field then creates a conduit in front of the ship connecting it to another location. Chroniton and Structural Integrity Fields are then projected to maintain temporal and structural stability. When exiting on the other side the vessel would exhibit a minor power loss; however, if properly executed, no other risks should result. Warp Drive is the most common form of propulsion that allows for travel at faster-than-light speeds in the Milky Way Galaxy. The Drive works through a controlled matter and antimatter reaction that is regulated by Dilithium Crystals in the vessels propulsion core. This highly energized plasma is then transferred to the vessel's nacelles, which generate the warp field that allows the starship to move at velocities that exceed the speed of light. While this is the most common form of Warp Drive used, some nations (like the Romulan Star Empire) use an artificial singularity to power the warp reaction. Modern vessels have further been modified to prevent accidental damage to the space-time continuum for the usage of high warp factors. No vessel can penetrate the Warp 10 Barrier which - at present time - is considered infinite velocity. Impulse Drive is a form of propulsion based on nuclear fusion. It operates by using the principle of vectored thrust to direct plasma exhaust outward from the vessel to provide mobility less than the speed of light. The plasma - which can also be used to provide power - has a secondary benefit in that it assists with the formation of a subspace field which also supports propelling the vessel. Through emergency modification the Impulse Engines can be set to generate a warp field, but at the cost of significant fuel consumption and time dilation. Current Maximum Impulse velocity is 1/4 the speed of light. RCS Thrusters are used aboard installations to assist with maneuvering needs. While thrusters are not capable of producing large amounts of speed, they are able to alter a ship's course, maintain orbit, or to move short distances. Impulse Thrusters are specialized propulsion jets based on the same principles of the Impulse Drive. These units are normally installed on outposts and starbases to maintain orbit.